I made some progress with my chikan work over the weekend (from Anita‘s stitch-a-long class). I added some variegated thread in blue and yellow. 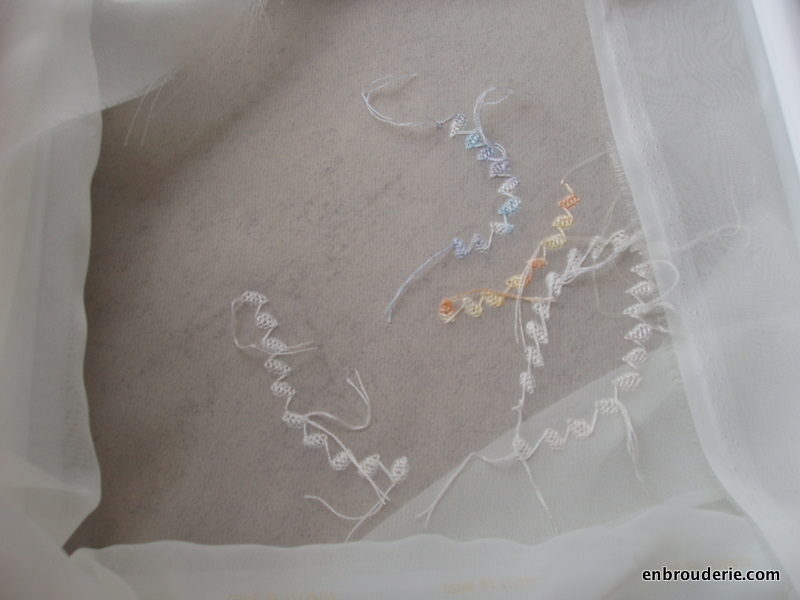 Here is the back of the work – this is double back stitch so from the back it looks like herringbone. Take a closer look at the front of the work. The thread on the front looks like a back stitch outline of the design, but the herringbone in the back colors in the shapes. Pretty cool! This entry was posted in Indian embroidery, My work and tagged Chikan (embroidery), chikan work, chikankari, embroidery, indian embroidery, Needlework. Bookmark the permalink. 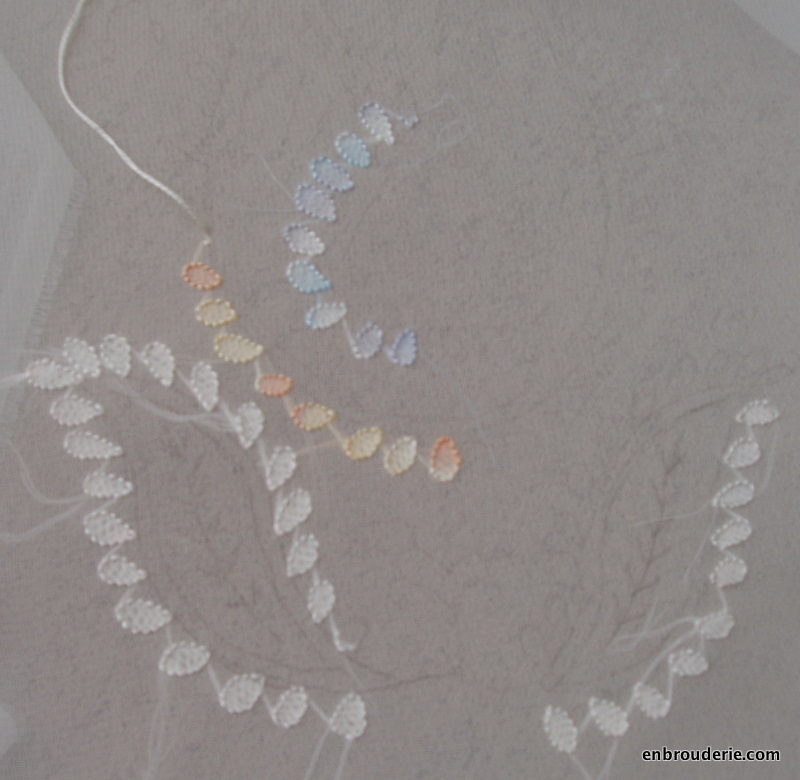 I like the blue variegated thread.All the lines will be covered by stitches.Don’t worry if we miss,the marks will wash out . I like how you added the different colors. I have begun the stitchingit seemed to have a rythmn and fun to stitch. oo! What colors are you using? 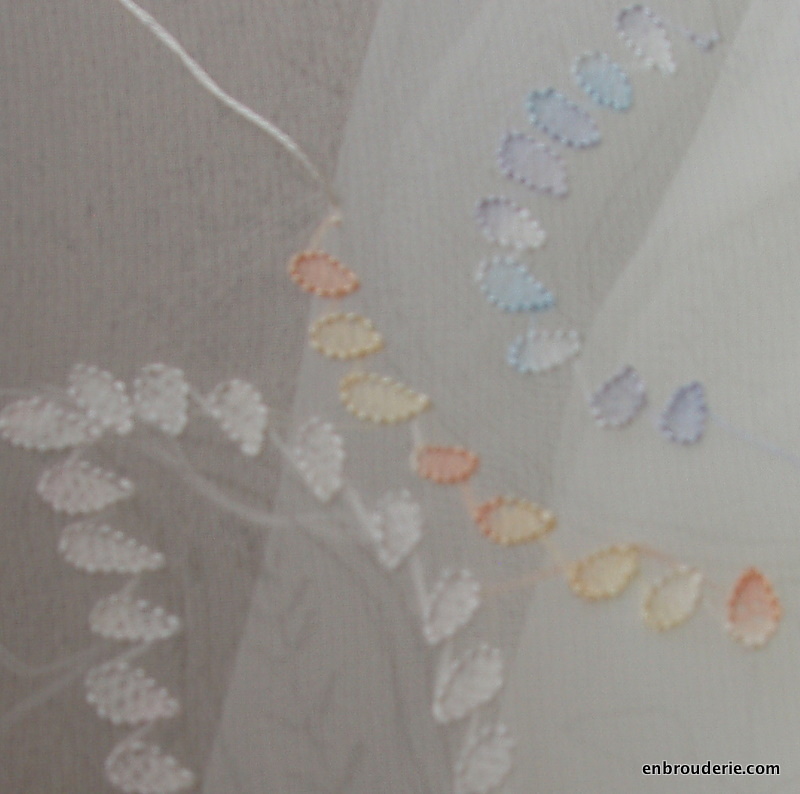 It’s a delightful effect, and a great way to show off skills in starting and finishing threads! Well, I haven’t really finished the threads yet! I am leaving them dangling until I am quite sure I won’t need the extra length for a correction to something. Yikes! I’m taking the same class and my stitches look awful compared to yours! I read that you’re using a chiffon fabric – is it cotton, or is it synthetic? Because I stuck with cotton, but the only fabric I could find was a very loosely woven voile, and I’m having the hardest time doing the double backstitch! Looking at your beautiful work I wonder if I should get one of the synthetic chiffons that I can find in town. Mine is synthetic chiffon. It’s real easy to stitch on, actually. Perhaps it would be worthwhile for you to at least try it out? The stuff is pretty cheap – I got mine at Joann’s for $8 a yard. I truly am enjoying your Chikankari class, but I have had to stop for a short bit as we are getting ready for a weeklong trip. But, really, I am greatful for your class, and pray that you have many more. THANKS a MILLION! !